“Defying Gravity.” No not me. No not Elphaba, our green tinted witch who becomes the Wicked Witch of the West or her bubble riding good witch pal Glinda. It’s this show that defies gravity. This is, of course, a pared down pastiche of a story based on a novel inspired by the thought — what might have happened to the witches of Oz before Dorothy “dropped in”? And it’s a pared down symbolic fairy tale fragment filled, often illogical story that serves to hold up the songs, push a plot and gets us to an ending in which destinies are fulfilled. Along the way, lines from 1939’s beloved The Wizard of Oz are referenced, audience chuckles are frequent and predictable. The characters don the costumes, the machinery runs, the songs are sung, the lessons are taught. 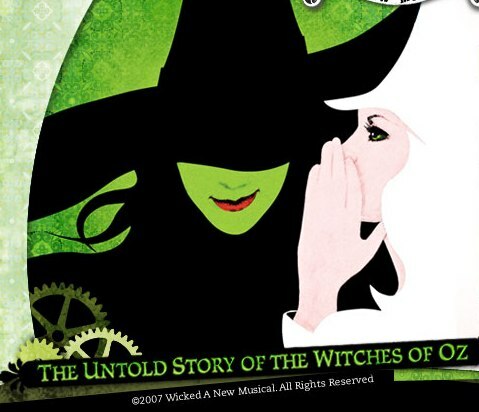 Emotions are evoked in a few particular tunes (my personal favorites are the delightful girl-hates-girl-at-first-sight duet “Loathing” and the already referenced Elphaba power tune “Defying Gravity”), as independent experiences. This show is not one that maintains an emotional arc or supports profound character development. We do have girls learning to work with and for each other, and hapless adults finally doing what’s right. And that’s something, truly. And all these lessons help to explain why the huge and historic Gershwin Theatre was rocking the night I viewed this show, long into its run, by hundreds and hundreds of tween girls who obviously knew the score, did not sing along but roared their approval of their favorite characters. And sometimes explained the “nuances” of the plot (young witches go off to school .. one popular and blonde, one ostracized and hated by her father and taken for granted and .. green) to the parents accompanying them. In this story of girls coming into their own, the pretty one has the talent to lead and the different one has a talent for witchcraft that even she doesn’t quite understand. And once she feels her power, she defies gravity. As does this big juggernaut machine of a musical. On and on and on. I am glad to finally know how the tunes are strung together on their feet on stage. I personally don’t feel the need to ever see this show again but I do understand its appeal to the young, to the adolescent, and to the young at heart. And I am glad finally to have seen it in its Broadway home. Several years into its fun. How old school. And to see it with a Chicagoan and Tony winning actress in a major role, Rondi Reed as the malaprop dropping Madame Morrible, was a real treat.